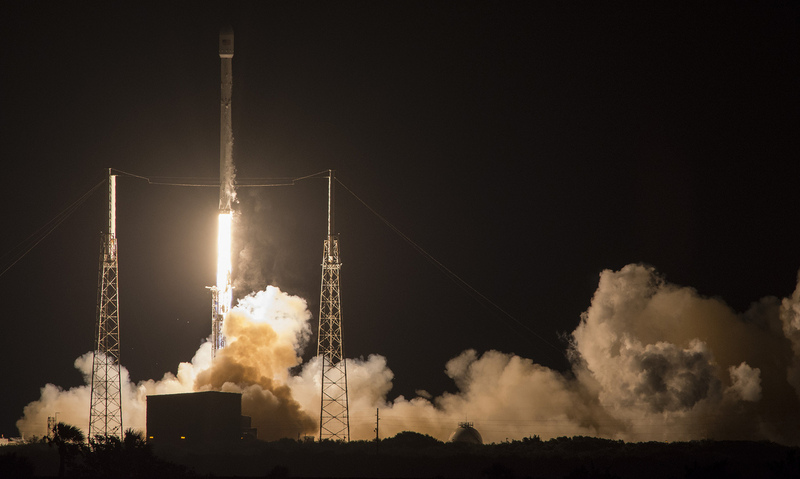 SpaceX Lands Falcon 9 On Floating Barge (Again) And Delivers Satellite : The Two-Way Despite uncertain odds, the company landed part of its Falcon 9 rocket in the open ocean for a second time. The rest of the spacecraft continued on to put a communications satellite into orbit. The SpaceX Falcon 9 rocket launches at Cape Canaveral, Fla., early Friday morning, carrying a communications satellite into space. SpaceX has done it again. Launching from Cape Canaveral, Fla., early Friday morning, the company successfully landed part of its Falcon 9 rocket on a floating barge. A second part or "stage" continued into space, carrying a communications satellite. SpaceX achieved the landing feat for the first time in April after a few spectacular failures — before that, it had only returned successfully to solid ground. "Now, SpaceX has both demonstrated that it can land the Falcon 9 at sea, and that the company can repeat the process," The Verge reports. It's not just a stunt. SpaceX founder Elon Musk hopes to reuse rockets. After Friday's success, Musk tweeted that he might need more room to store them. With recent adjustments to the Falcon 9, Musk wasn't sure how the latest mission would go. The rocket was deploying a Japanese satellite into a geostationary transfer orbit — when it reaches its final position, the satellite will orbit in a way that "it hangs seemingly motionless above a point on Earth," NASA says. Here's a video of the launch, webcast live by SpaceX.